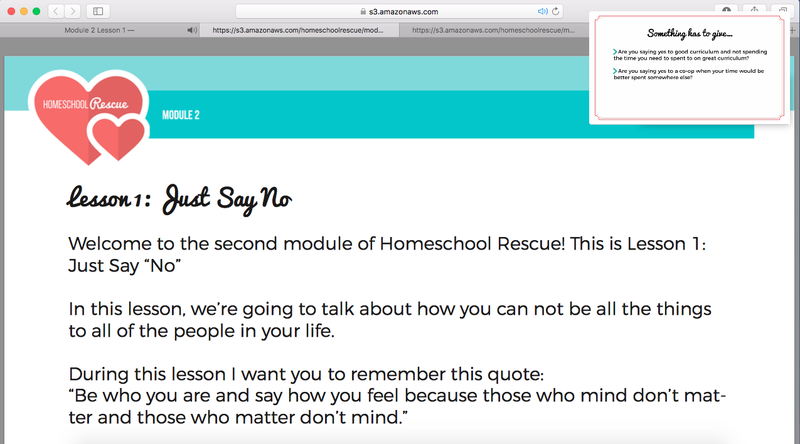 Homeschool Rescue from Only Passionate Curiosity is an online course designed to help you "breathe new life into your homeschool." This course is for any mom, dad, or homeschool parent or teacher who needs a new perspective and a fresh start. The course currently consists of five modules with a total of 20 lessons. Each lesson includes a powerpoint style video ranging in length from 15 to 30 minutes, homework assignments, and resources. 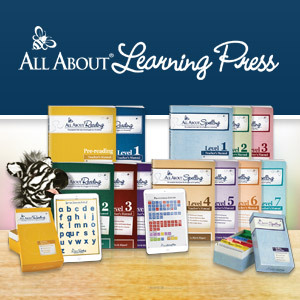 Each lesson also includes an audio of the lesson, a transcript, and note taking pages. 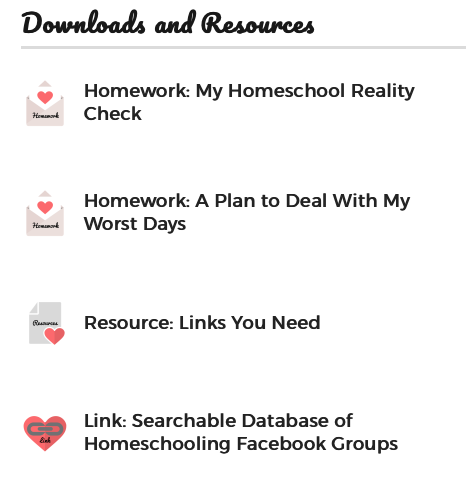 How did I use Homeschool Rescue? I watched the lessons on my computer. The videos pop up and play on my desktop, so it was nice to be able to refer to the printable forms she mentioned while I watched. I kept my computer, a pen, and a clipboard with the schedule and any worksheets I had printed off with me during the review period to work on throughout the day. For example, I once took the clipboard on a date with my husband to talk about the assignments from the lessons, and I involved the children by having them help me fill out charts and make lists. I utilized the downloads and resources that came with each lesson and printed the homework assignments. I was able to download the audio as well as the transcript of the audio, but I mostly watched the videos on my computer. At the end of Module 2, I was asked to fill out a feedback form. Since I'm writing a review, I took a screen shot to share my answers with you. I liked the format of the program with the videos, downloadable transcripts, audios, note taking forms, printable forms and homework assignments. I took these to heart and printed many of them. I carried them around on a clipboard with me to talk about them with my husband and the children, and I did my homework and applied many of the lessons to my homeschool. Some of the homework required deep thought and introspection, such as creating a homeschool mission statement or deciding what 10 things my child must know before they graduate. I'm not a planner person, so I didn't care for the printable academic planners, but I did like the printable to-do lists for kids. I printed these for each of the kids to use as a check list for subjects they need to complete each day. This is already something I do in my homeschool, but the forms were fun and something new. I was not on Facebook during this review, so I did not have access to the members-only Facebook group and cannot speak to the benefits of that. I did feel like I was missing out on the group support element of this course, but it was not enough to make me want to join Facebook just to join the group. When we started, there was only 6 weeks of content, and I was close to being done when she added 2 more weeks. So, this ended up being an 8 week course. I had already done a lot of homework, so I was a little overwhelmed knowing I would not be able to complete the course before my review was due, but it is designed for you to work at your own pace. In fact, I don't think I would have kept up the pace on the schedule had I been working on this on my own. It was not a terrible pace, I just would have worked through it more slowly and not given it as much importance in our busy spring days. Summer would have been a much better time for me to do this course. I thought the audio quality was poor. Heather has a soft, quiet, pleasant voice, but it was very hard to hear. I couldn't have any noise in the room while watching. The best time to listen was at night when the house was completely quiet. The problem with that is that I am very tired at the end of the day and am ready for bed as soon as the kids go to bed. This is not the best time for me to be working through a course on homeschool burnout. I mentioned this in my feedback form above and noticed that Heather added a tip box to the site that said to make sure the video volume was turned up. Check. She also suggested using headphones. I did not have headphones during this review. I have a Macbook Pro and my speakers work just fine for everything else I do on the computer, including watching movies as a family, listening to music, and doing other video and online lessons that require the use of my computer speakers. We have never had a problem with being able to hear, so I do not feel this was a problem on my end. 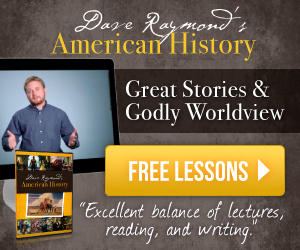 How did this benefit (or not) my homeschool? In Module 1: Lesson 1, my homework was to do a homeschool reality check. I wrote that if I could change one thing about my homeschool, it would be to have a steady rhythm to our days. I really struggle with being consistent. I wish that I could follow a schedule and stick to it, and I would like to be able to to fly by the seat of my pants less. So my goal for myself is to focus on rhythm in my homeschool. I like the freedom and flexibility I have, but at the same time, I crave routine and a steady rhythm, especially for the kids. I also made a plan to deal with my worst days. I made lists of things my kids can do on their own without me, people I can talk to, how I can unwind, and things I will allow myself to do. I made a list of things my children must know before they graduate, too. Being a homeschool veteran (I've graduated my first homeschool student and I've taught every grade), these were all common sense things to me, but I can see how this could be helpful to new and even seasoned homeschoolers to have them down on paper. I struggled through some parts of Homeschool Rescue that I didn't think applied to me. For example, I don't like to keep a lot of craft items. So, I wasn't interested in printing the craft supply list and buying any of the supplies. Then, as I was looking over the lesson plans for a new foreign language curriculum for my little one, I noticed it required a plethora of craft items. So, I printed the list, went shopping, and made a small craft bucket. I did not feel everything on the list was necessary, but added a few school supplies that I thought were necessary. Her point was to have these items on hand in case you need them, so now I do. I had already started many of the suggested activities on my own before starting Homeschool Rescue. Some of the lessons gave me motivation to go ahead and finish them up, while others just reaffirmed what I was already doing. For example, I rearranged bedrooms a few months ago so I could turn a bedroom in the back of the house into a school room. My goal was to move all my school stuff out of the living and dining rooms because it was hard to keep clean. My 2nd goal was to have a place for everything. The school room is smaller now, so I took Heather's advice to box up some things I don't need for this school year and took them out of the room. I put them in plastic bins with lids to put in the basement. Wouldn't you know, I was digging in the buckets a few days later? But, I enjoy that our school room is clean and clutter free, and I have a place for everything. I tried the lessons on scheduling and creating a pacing guide, but I have never been a planner person. This is one reason why I loved a boxed curriculum. It is all scheduled out for me. I had considered planning my own curriculum this year, but all this extra work just convinced me to stay with a boxed curriculum and let them do all that for me. A lesson in Module 3 really opened up my eyes. You guys, this lesson hit home with me. 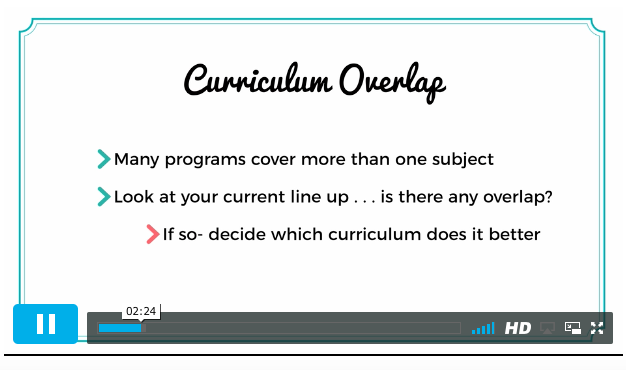 Is there any overlap in my current line up of curriculum? I heap curriculum on top of curriculum. I did that this past year, adding an American History curriculum on top of a unit study that covered American History. I was so afraid of gaps that I doubled up. 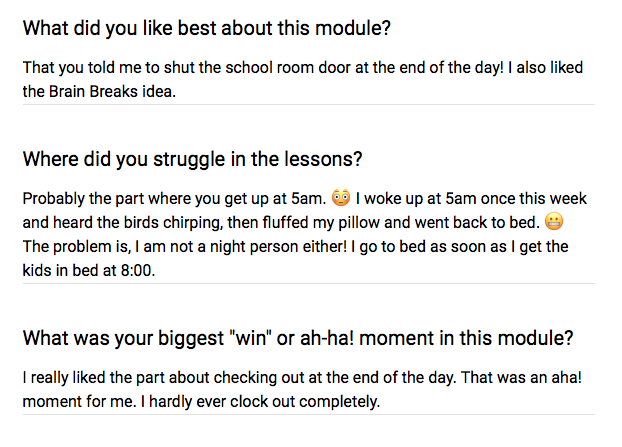 So, I decided I would pick one curriculum and stick with it this coming year, and I loved Heather's advice to use the one that does it better. 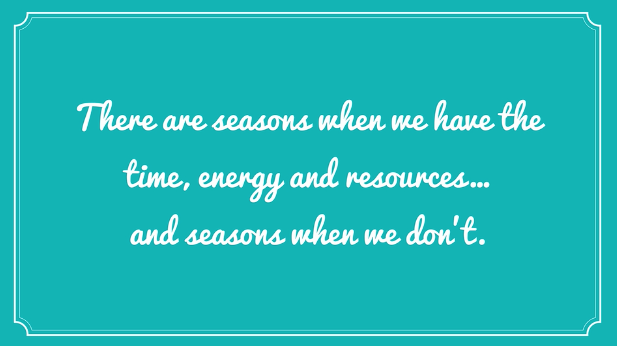 At the beginning of winter this school year, I reached a point that I was struggling with chronic fatigue. I was overwhelmed, burnt out, and feeling depressed. Something was not right. Through prayer and guidance from the Father, I figured out what was wrong with me, but it was not something that Homeschool Rescue could have helped me with. I discovered I had a genetic defect that required supplementation. When I was feeling better, I addressed how I felt about school, family, and life and did something about it because I was at a better place. The problem with a resource like this is that the amount of work it takes would be overwhelming to someone who really needs it. 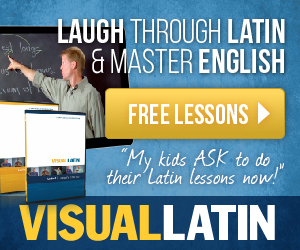 Lessons take 20 to 30 minutes with at least 30 minutes or more of homework at times. I do not recommend this for someone who is really struggling. In fact, Heather even says so in the very first lesson. So, I recommend it for someone who is ready to make some changes. There is a lot of course work and personal evaluation involved with this program that I think would be overwhelming if you are really struggling. Much of it requires personal reflection as well, and that is hard work. Since this is the end of a school year, I'd recommend that if you are interested, that you take some time off and then start this course to get ready for the new school year. While there is a 60 day schedule, Heather recommends you complete the course at your own pace. She sends you encouraging emails throughout the course and is very quick to reply to emails. I think she is offering a valuable resource that will encourage you, inspire you, and even challenge you to try a few new things. Heather will only be offering Homeschool Rescue for sale a few times a year to make sure she gives each class her full attention and support. She is currently accepting enrollment for the Summer 2017 class for the price of $97 ($137 for VIP support). 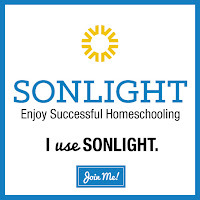 You will have lifetime access to the course and can work at your own pace, or you can join the class and work alongside other homeschool parents for more support and encouragement. Connect with Only Passionate Curiosity on: Facebook | Twitter | Pinterest | Instagram | Google+!